Now he does. Five years ago, Chip, his wife Amy, and their young son moved from a smaller home nearby to the Union Park three-story he’d admired. The new place—with its six bedrooms and four full and two half baths—had plenty of space, beautiful oak woodwork, and was right smack in the neighborhood they loved, but it needed some changes to become a family-friendly space for the 21st century. 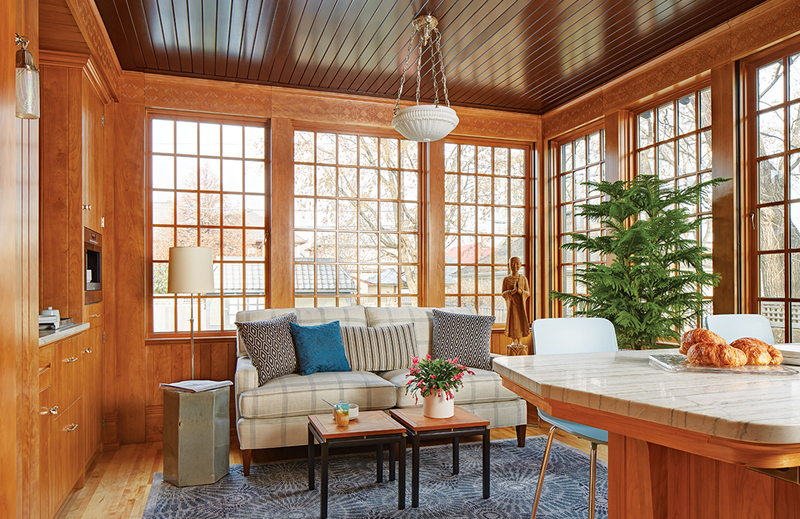 When they considered who should help them with the transformation of the 1908 home, originally designed by St. Paul architect Franklin Ellerbe, they quickly decided on David Heide Design Studio, which specializes in exactly that sort of melding. Says Chip, “His firm was perfect for the process.” Heide worked in concert with project architect Chris Christofferson and Minneapolis contractor Dovetail Renovation on the yearlong job. 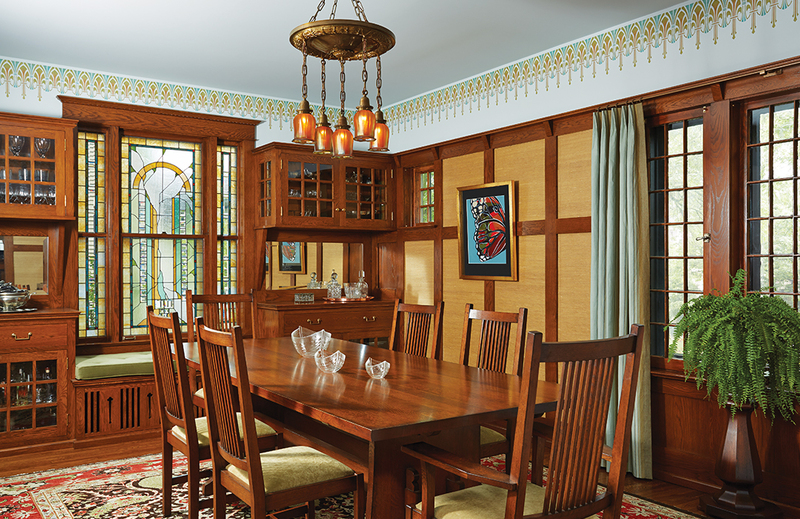 Although nearly every room in the 4,800-square-foot house was touched during the restoration/addition/remodeling process, it is the remodeled dining room, kitchen, sitting room, and master suite that really made the house livable, say the couple. 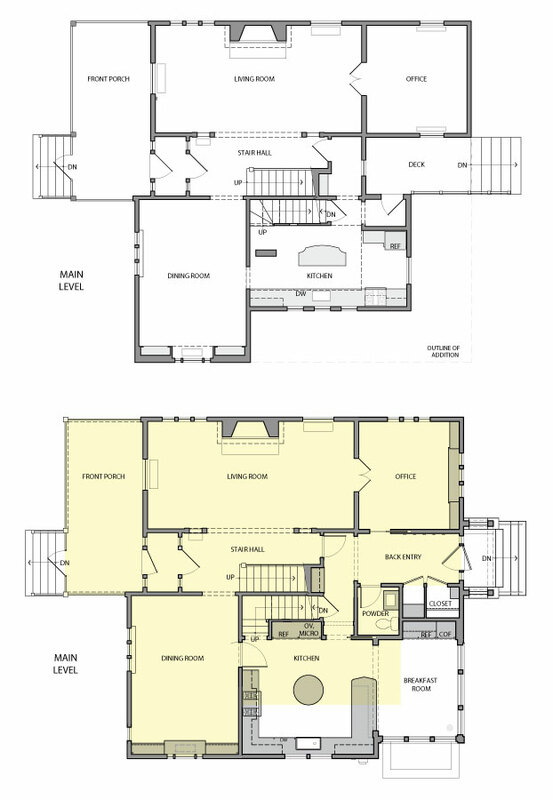 As for the kitchen, it benefits greatly from the 1,300 square feet added to the back of the house, an addition offset from the main part of the house to avoid changing the front elevation. Now it is a large, bright space with east-facing windows, red birch cabinetry, and creamy honed quartzite counters that mimic marble. A plate rail holds iconic Royal Copenhagen blue china, gifts from Chip’s Danish family. The lighting is a combination of antique pieces and some custom-designed by a California artisan. The room’s eye-catching island is round, which makes it “fun and functional,” says Amy. “And it’s easier to walk around,” notes Chip. “You’re not always banging your hip on it.” They’ve found it serves as a great prep space as well as an ideal location for setting out a buffet. 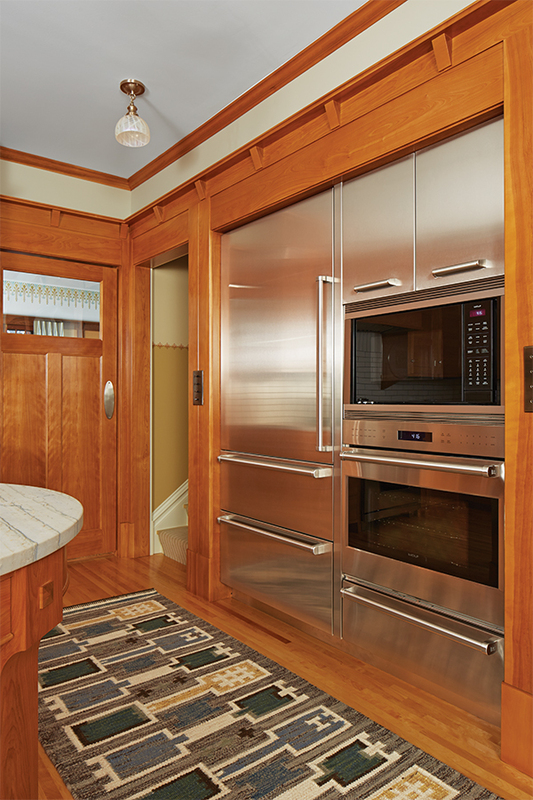 One puzzle was how to reconcile modern stainless-steel appliances with the Arts and Crafts style. Heide and Christofferson solved the issue by designating one wall, set back from the plane of the room, as the stainless wall. It contains a large refrigerator, wall oven, microwave, warming drawer, and even a stainless cupboard. The sitting room, which Heide likes to call “the lounge,” is a jewel-box of a space with a fir ceiling, subtle stenciling near the ceiling, and two big walls of casement and stationary windows. It’s a favorite spot for the family to read and gather, says Amy. Nearby is a half bath with dark green floral William Morris wallpaper and a generous mudroom space, complete with a bench and wall of hooks opposite a large coat closet, and equally spacious utility closet. Working with builder Dovetail, Heide and Christofferson strove to meet the challenge of, as Heide puts it, “adding to a house that was beautifully designed to begin with.” Special challenges included figuring out how to run the roofline so it looked as beautiful from the back as from the front, and how to add on to the home without making it appear imposing in the neighborhood. All parties are pleased that the bigger home doesn’t seem out of place on the block, says Heide. The home was reshingled and repainted, but there was very little change to the front elevation. It’s clear the Pearsons’ goal has been more than met.